For more photographs, click the name of each quilt to go to its blog post. Fabric: Strips of various fabrics from my stash. There’s some Lizzie House in there, and Flea Market Fancy, and a lot of things I picked up at the local quilt shop. Back: Light blue& white Kona solids. Bound in another blue Kona solid. Quilting: Straight lines in the white stripes, stitch-in-the-ditch quilting for the strips. Fabric: Kona Clover and Hello Pilgrim green stripe, and miscellaneous scraps for the postage stamp squares. Back: White fleece, for a soft and fuzzy feel. 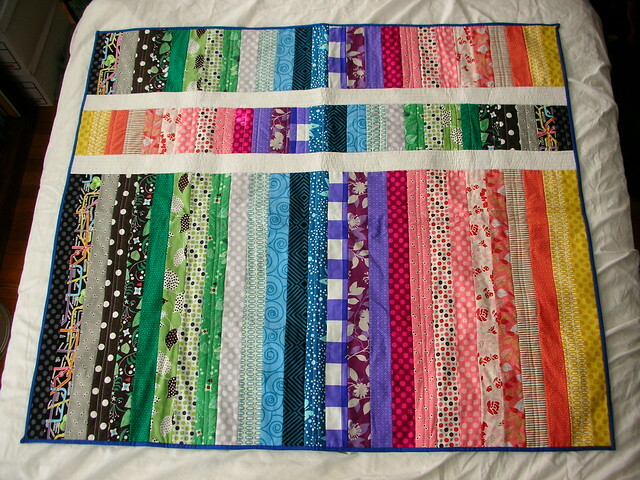 Quilting: Straight lines along the borders, 1/4″ on each side of the seams. Orange peel quilting in the postage stamps. Recipient: My neighbors’ new baby. Design: Just a simple Dresden medallion quilt, no pattern. Fabric: Perk Me Up, from Timeless Treasures. Quilting: Machine-appliqued the Dresden medallions and fans down, no other quilting. It’s a wall quilt. 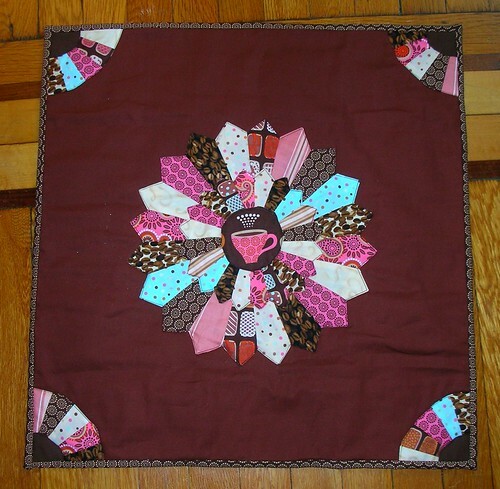 Design: Filmstrip Quilt by Crazy Mom Quilts. Fabric: Cosmo Cricket’s Circa 1934 in red and Kona Cotton, either Cream or Bone (I don’t recall). Back: A red and white stripe I picked up at a yard sale. Quilting: Straight line quilting in white on either side of sashing seams, forming a lattice pattern. Recipient: Umm. Still figuring that one out. Design: Mixtape Quilt by Elizabeth Hartman. Fabric: Six prints selected by the friend for whose son it was made. Back: The two smallest prints from the front of the quilt. Quilting: Free-motion quilting, zig-zag lines. Recipient: Tobin, a friend’s toddler. 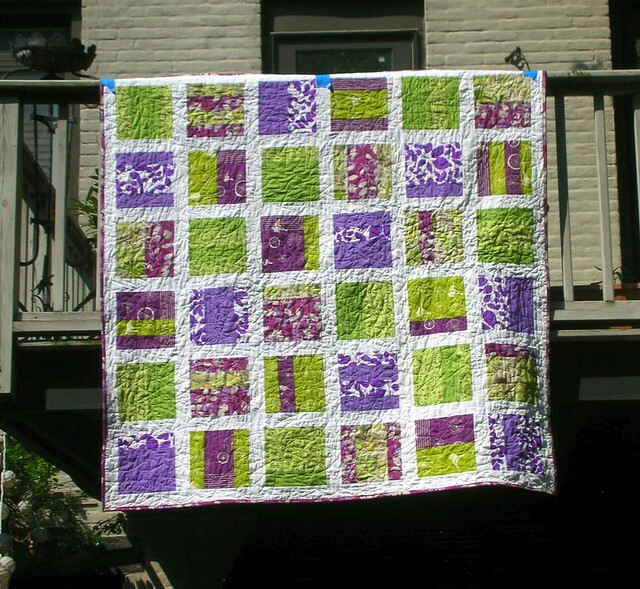 Design: Nine-Patch Lattice Quilt by Elizabeth Hartman. Back: The same as the front. Quilting: Lattice grid, following the patches. Recipient: The nephew of one of my college friends. 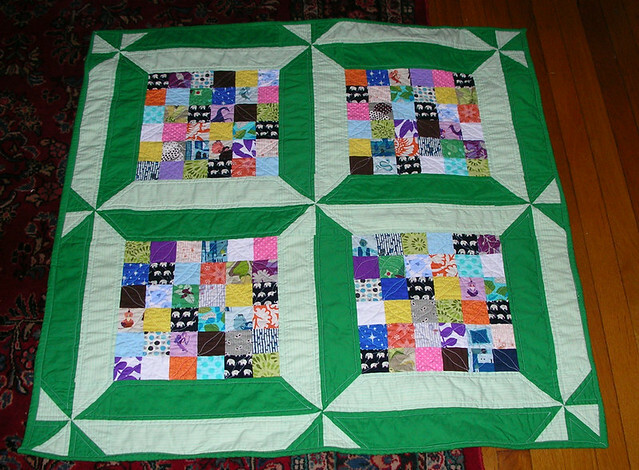 Design: My own, based loosely on a quilt I made with my grandmother when I was a teenager. Fabric: Cotton solids from Jo-Ann Fabrics; the dark green is an old sheet. Back: Ladybug print from Jo-Ann Fabrics. Quilting: Straight lines along the seams. Recipient: My cousin’s second daughter. Hi Alisa, what wonderful talent. 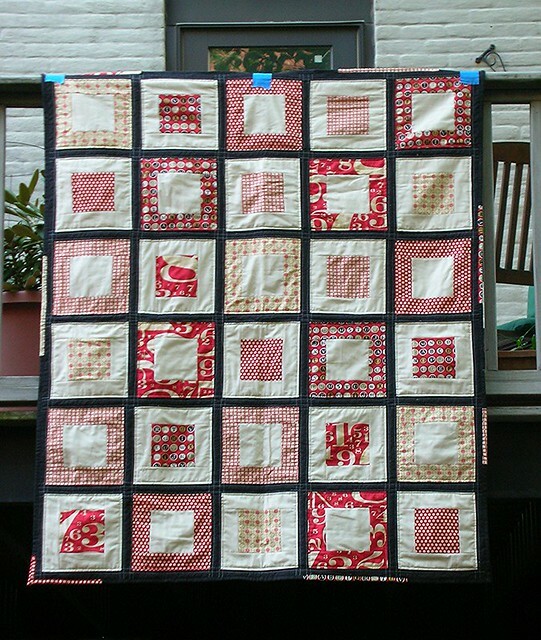 In particular, I love your circa 1934 filmstrip quilt and Tobin’s mixtape – lovely!